This quilt contains lots of my favorite fabrics, going for a softer, more neutral look. It’s paired with nearly every neutral I had in my stash – mixing up lots of Kona, Essex and Free Spirit solids. I bound it with an aqua polka dot print I’ve had in my stash forever. It’s quilted with straight lines of random widths. It does take quite a bit of time to quilt, but I think it’s well worth it. And here’s the back! I’m really quite taken with it — it’s just a mix of all the leftover neutral solids along with just a few bits of color. My scrappy triangle tutorial can be found here. These are obviously the not-so-scrappy variety, and for this quilt I made them smaller - with a finished block size of 4 1/2 x 7 1/2. This entry was posted in [search] Other Quilts, Posts about Quilts, Quilts. Bookmark the permalink. Think this quilt is beautiful. Amazing what neutrals can do. I love the back of this quilt so much. So peaceful. Stunning in its calmness. Tou are a genius. 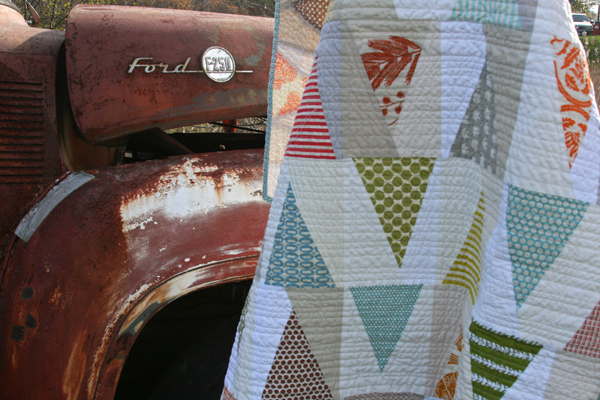 The mix of neutrals add an amazing touch to this quilt. And the back is fabulous! I love the back, love it! That is gorgeous!! The mix of neutrals with the spots of color is beautiful! Thanks for sharing! Cute quilt! The colors blend together so well and I love the back! Wonderful work, thanks for sharing! Wonderful quilt and quilting. You are so generous to share your tute and process with us. Love the quilt and setting ~ the truck is fab! I’m amazed that you get so much done with little Max! I love the serenity and beauty of the quilt. I also love how you photographed it with the old truck. 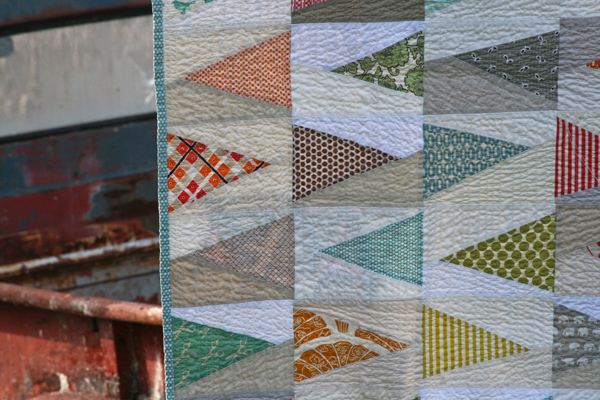 I adore this quilt and envy your stash of neutrals (something my stash seems to be lacking). I have a question: Do you pencil on your lines or just “free hand” them? Do you fret about keeping them truly straight or not care if they are a bit wobbly? I’m a bit of a perfectionist by nature and am hesitant to try straight line (non-in-the-ditch) for fear I’d be so wobbly I’d want to rip it all out. Thanks! I absolutely love this quilt – its one of my favorites of your great work! i love this! the colors and quilting are perfect. 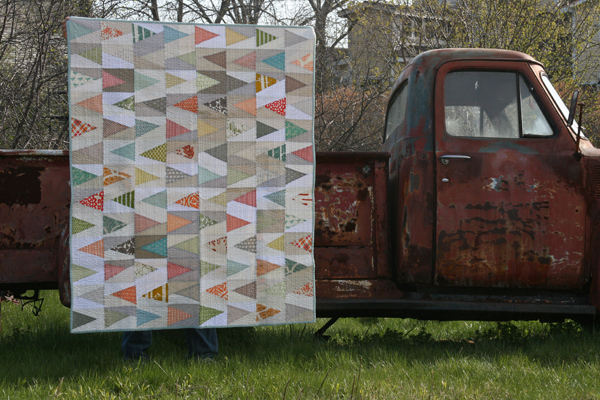 Beautiful quilt and perfectly photographed with the old truck! Well done! Love the colors – and it looks perfect with that truck! It really is lovely and the colour combination brings the softness out so well. Beautiful quilt! I love the wide variety of neutrals. I love this quilt – for all the same reasons you do. The varied neutrals really show off the prints and keep the entire thing super interesting. I’m straight-lining a queen size now and it certainly does take forever, but looks amazing. Ooh, I love this quilt. The colors are great, and I just love the triangles. I like almost all of your quilt designs, but this is one of my very favorite ones! Ahhh, you’re so stinkin’ talented! I love this, as usual! Very nice! Looks like one of those comfy, cozy, wrap yourself in kind of quilts! Love the pictures of the old truck too. I like it and maybe sometime I’ll give it a try in a pillow size. Thanks for sharing. Looks great. I just love the mix of neutrals that create the background. 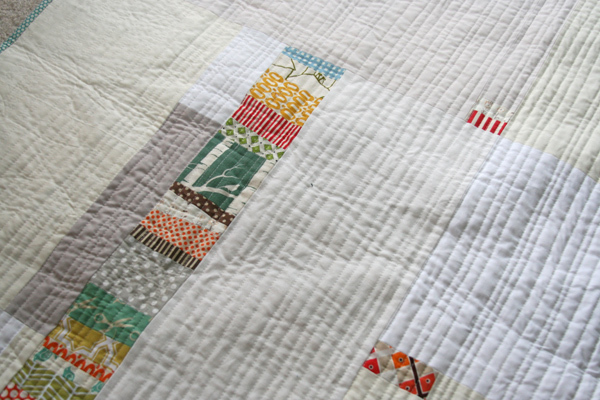 Love the quilt … and the binding! Very serene and calming. I truly relate to it all. Ooo, I really like this one Ashley. Really really! Absolutely beautiful…. I really love this one!The colors are lovely. It’s gorgeous. I love that it’s colourful but not in a punch-you-in-the-face way. There’s a lot of colour but it’s still very neutral and belongs just about anywhere, present but not taking over. Beautiful quilt (as always)– and I LOVE the photos. The backing is just as cool as the front. That is beautiful. Perfect setting too! Super quilt and I love your quilting. The back is awesome too! …and I love your photo shoot setting! I love the photo shoot you used to display your fantastic quilt. The neutrals are really working! Absoutly Stunning!! !This may be my new favorite, of course the photo shoot with the old truck is out of this world!!! I can see some pieces of fabric from Ink & Spindle in there! You know I think this is my favourite of all your quilts. It’s just lovely. 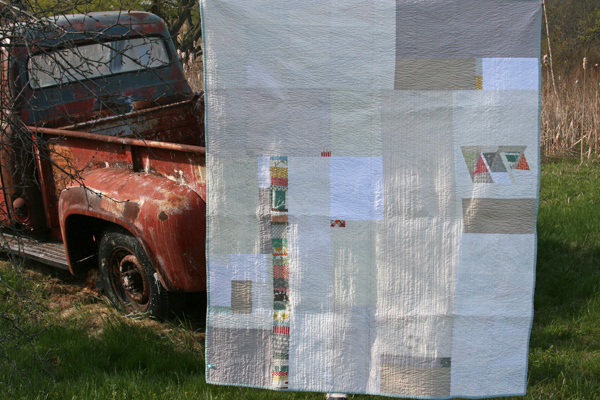 The truck and the quilt go so nicely together and the way your piece your backs is always a nice surprise. Love this quilt so much had to ‘pin it’. Also copied your scrappy triangles tutorial. Thank you so much for all the work you put into your blog. It is an amazing resource. I do love your style. I love this quilt! The neutral color scheme and pattern just work so well. I love this style of quilting, I’ve tried it before and plan to use it on another quilt soon. I have a question about your technique. Whenever I try this type of quilting, even pinning heavily and using a walking foot, I end up scooching the entire top toward the direction I’m sewing, like I’m pushing fabric in front of the foot. I’ve heard of people alternating the directions of their seams or sewing a few widely spaced ones first and then filling them in. How do you make it work? This is absolutely AWESOME! It’s going in my bucket list. I know I probably comment every time that your new quilt is my favorite, but no, really, this is gorgeous!!! Bravo! I love the tan quilt. It looks so warm, cool, and cozy all at the same time. It’s just lovely!!! I am haunted by this quilt, and am obsessively trying to duplicate the look. Are any of these fabrics used still current? Can you tell me what you used,, I have a teen son that this quilt is perfect for, and love your fabric choices, and help with fabric lines you used would be most appreciated!